The Book Review: Author Alan Moreton’s work, “The Book Traveller” is also available on Amazon in paperback or on Kindle as an eBook. Author Alan Moreton’s work, “The Book Traveller” is also available on Amazon in paperback or on Kindle as an eBook. Alan Moreton is the author of "The Book Traveller", the Classic Fiction Fantasy Adventures of Thomas Howard. Thomas Howard believes he is about to retire to a life of ease but the mysterious Mr. Ridley sells him a chair called, "The Book Traveller", which takes him on an emotional roller-coaster journey through his favorite classic books and into the murky depths of his terrifying past. As his past unfolds his volatile relationship with the beautiful, charismatic but tormented Chinese/Hawaiian girl, Heather Lee reveals obsessions of drug addiction, adultery and crime, which eventually will lead to heartbreaking tragedy. The travel back through time places Thomas in a position to view his past through the lens of each character whose persona he assumes, giving him a deeper understanding of himself and of the world around him. Here's what others are saying after reading the Chapter Sampler PDF that is offered on Alan's site; "I loved it! ", "It is already a great story! ", "What a brilliant opening! ", "This is fabulous! ", "I am completely enchanted."…. Alan was born in Birmingham, England. He has lived in the South East, principally London and Essex. He lived in South Africa for five years in the late 1980's early 1990's. His major influences are classics of English literature and the writing style of W. Somerset Maugham, whose clear but penetrating style he tries to emulate. He is an eclectic writer of fiction including crime/mystery/thriller, classic fiction, historical and memoir. Alan Moreton is the author of "The Book Traveller", the Classic Fiction adventures of Thomas Howard and "The Messenger", a further Classic Fiction adventure of Thomas Howard. He is also the author of "At the World's End", a Historical novel set at the end of the Victorian era during the Boer War in South Africa and the suffragette Movement. His first published work is "The Confession of Sandy Harris", a Rev. Dr. Roger Ratcher Mystery. He is also the author of The Temptation of Anthony Stone, a further investigation of the Rev. Dr. Roger Ratcher. Be sure to visit Author Alan Moreton's website for further information on "The Book Traveller", other great books by Alan and how to download the free Chapter Sampler PDF and read the opening chapters of "The Book Traveller." You might also enjoy visiting Alan's blog Tales Of The Tortoise for some great reading. 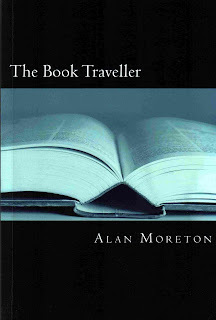 Author Alan Moreton's work, "The Book Traveller" is also available on Amazon in paperback or on Kindle as an eBook.